Earn some easy loot and unlock the Pirate's Life For Me achievement by following Xenia's treasure maps to the location of each hidden artifact. 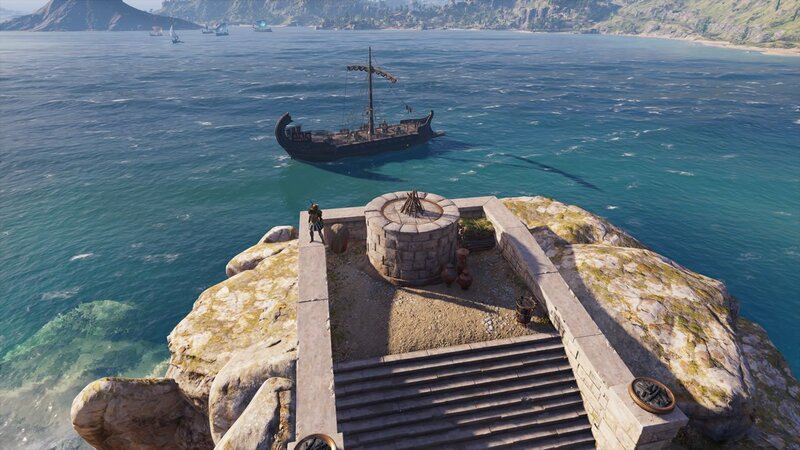 Players rocking around Assassin's Creed Odyssey's fresh take on Ancient Greece are likely to stumble upon the pirate Xenia, a stout woman of firm resolve who will eventually ask for the hero's help in tracking down various artifacts. 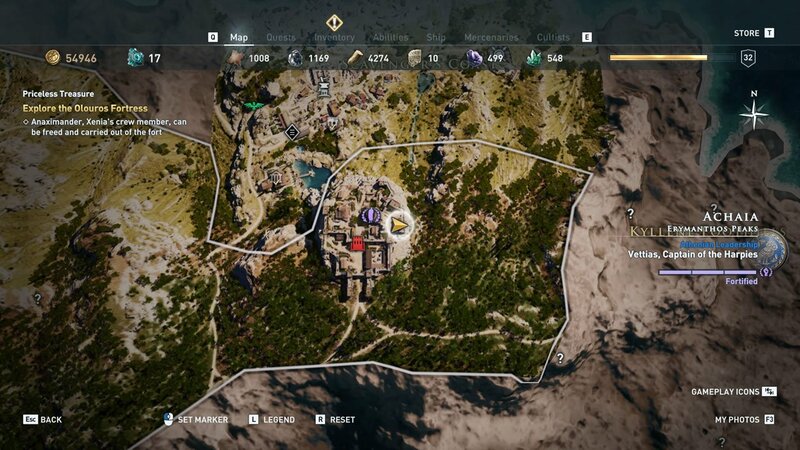 This is accomplished by following Xenia's treasure maps, the likes of which aren't exactly easy to follow, either because their locations are vague or because the maps seem to be pointing players in different directions toward unrelated rewards. First things first: before players can start tackling Xenia's five separate treasure hunts, they need to fulfill certain requirements. Neither Xenia nor her treasure hunts will be available until players complete the side quests Red in the Wreckage and Lost and Found. At that point, players can converse with Xenia to have her ask the hero to track down five (technically six) distinct treasures. Additionally, it's recommended but not necessarily required for players to be around a mid-game level before starting Xenia's treasure hunts — maybe level 30 or so, though some of the tasks can be accomplished around level 17. For this treasure hunt, players will be given three different treasure maps and tasked with finding the Golden Feather of Ajax. 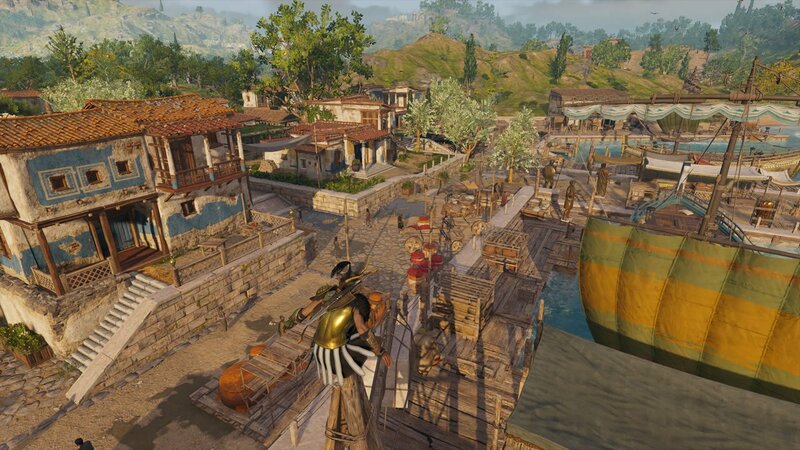 Looking at the maps isn't strictly necessary for this mission; instead, head to Isle of Salamis, found just west of Attika. On the island will be a lighthouse — the Lighthouse of the Father of Ajax, as it turns out. Inspect the cloth-covered pot near the lighthouse, then walk down the stairs and speak to the lighthouse keeper to learn that the Golden Feather of Ajax was stolen by bandits. He'll point players toward the bandits' hideout, the Mycanean Tomb of Ajax, located in an underground vault near the middle of the island. 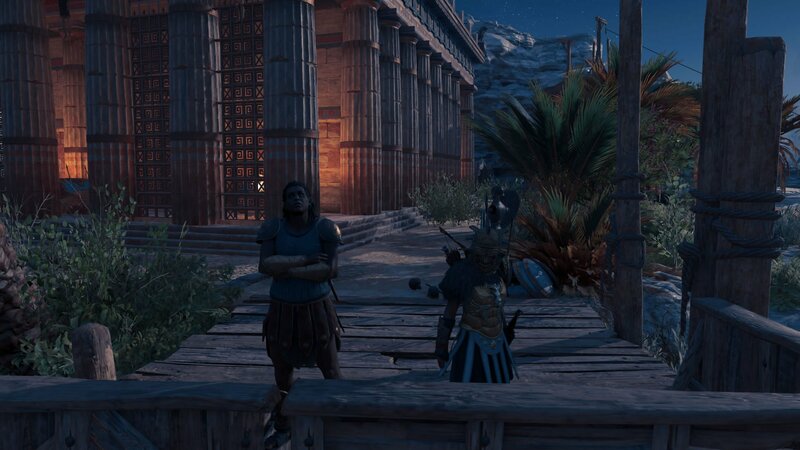 Bust in and crack the bandit's skulls, then search the bandit leader's corpse to find the Golden Feather of Ajax. With the feather in tow, return to Xenia to complete the quest. Xenia will be pleased with the hero's aptitude for seeking out hidden treasure, and will offer a reward in the form of currency as well as another treasure hunt. This one is called Sacred Vows, and it involves discovering the location of a golden Macedonian Bracelet to be used as an offering to the gods. 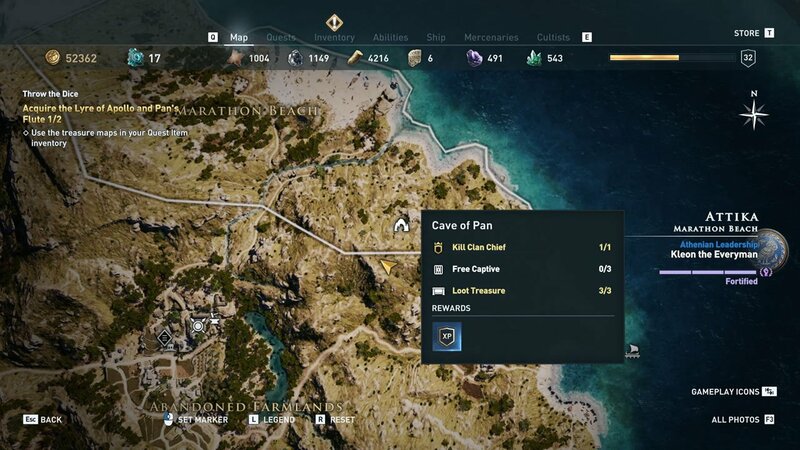 In this case, it's the third map that Xenia offers that will be provide an accurate location for the treasure: in Cape Sounion, on the main island of Attika, in an area known as the Sanctuary of Sounion. Head to the location, speaking with various townsfolk, opening various boxes, and generally searching for clues to the bracelet's whereabouts. After enough time spent investigating, players will stumble upon a couple arguing about the bracelet Xenia is seeking — they'll be the ones hanging out nearest the water's edge. Through conversation, it is revealed that the bracelet was thrown off a cliff into the Mediterranean sea. No problem; just dive in after it. The bracelet can be found not too deep underneath the water's surface, next to the cliff edge and a patch of coral. Grab it, then return to Xania to put an end to the second treasure hunt. Back in Xenia's company, the pirate will be so happy with the hero's performance that she'll offer up yet another treasure hunt. This one is called She Who Controls the Seas, and it involves tracking down Triton's Shell of the Tides, a golden conch that can reportedly control the sea. The map needed for this hunt is the one that shows the Triple Peninsula of Chalkidike in Makedonia. 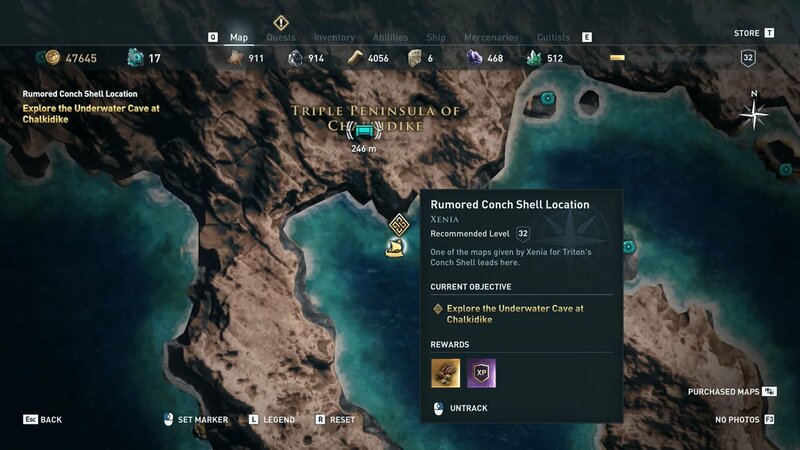 Specifically, the player needs to head to an area known as the Underwater Cave of Chalkidike, which can accessed by diving into the water at the location featured on the map, just off the southern coast between the western and central peninsulas. A good way to find it is to search for the boxes floating at the water's surface. Inside the Underwater Cavern, use Athena's sight to get a better view of the surroundings, then follow the path up and out of the water and back into another pool before surfacing on the other side. 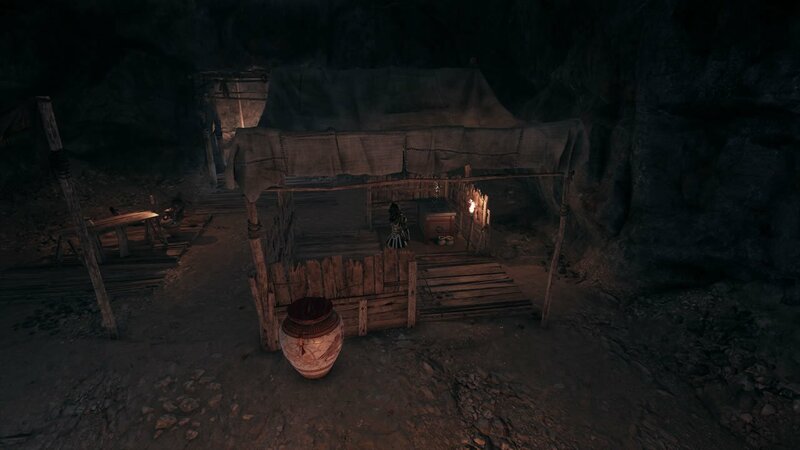 Some bandits will be lurking around this caves, so dispatch them through any preferred means, then search around the cave to locate the conch shell, which is sitting within a chest flanked by wooden barricades. Grab it, then head back to Xenia. Once again, Xenia will express her own sort of gratitude for the hero's success, and will offer monetary recompense as well as the option to track down even more artifacts. 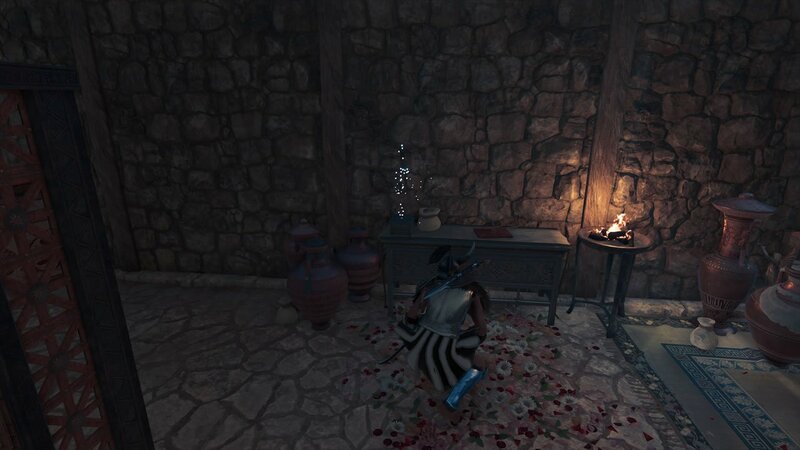 This time around, Xenia will ask the player to find two items: Pan's Flute and Apollo's Lyre. There's a catch, though: a man named Autolykos stole the maps from her, and they must be found before the treasure can be located. Xenia will point the player toward the man's typical hangout in Nauplia, specifically the are known as Wetlands of the Hydra. Head for the docks within the area's settlement to locate the man, then smash the nearby pots in order to convince him of the gravity of the situation. He'll divulge the location of the maps, hidden within his home right next to the Nauplia Shipshed. The path won't exactly be easy — Autolykos has the place well-guarded — but stealthy heroes should have no problem sneaking in and grabbing the maps out of the treasure chest near the main entrance. With the maps in-hand, players will be in for an easy ride. The first map will plainly show that Pan's Flute can be found in the Cave of Pan, which is found around Marathon Beach in northern Attika. On the other hand, Apollo's Lyre can be found not too far from the Forgotten Ruins of Makris within Euboea — the lyre is sitting out in the open among several stone columns and a statue of a man being bitten by a snake. Grab both the treasures, then head back to Xenia to start the final treasure hunt. Once again in the company of the fearsome pirate, Xenia will introduce the player to Galateia, who will tell a story of how she lost precious cargo after her crew was attacked on a previous mission. Agree to take on the quest to begin the search for Galateia's Priceless Treasure, the admittedly cheap-sounding Old Coffer. Galateia informs the hero that her ship was attacked near Pellene, and eventually tasks players with finding the Olouros Fortress. The fortress itself is in Achaia, a location on the eastern end of the area known as Erymanthos Peaks, just south of Scavenger's Coast. This area will not be easy — the level requirements for this mission indicate that players should be around level 43, so expect more than a few difficult encounters. Players under that level will need to make the best use of stealth possible. Within the fortress, not too far from a canvas-roofed entrance on the southeastern side, players will spot a small table next to a lit brazier; the Old Coffer can be found on the left side of the table near some ornate pots. Grab it, then return to Xenia to complete her quest line and earn the Pirate's Life For Me achievement. 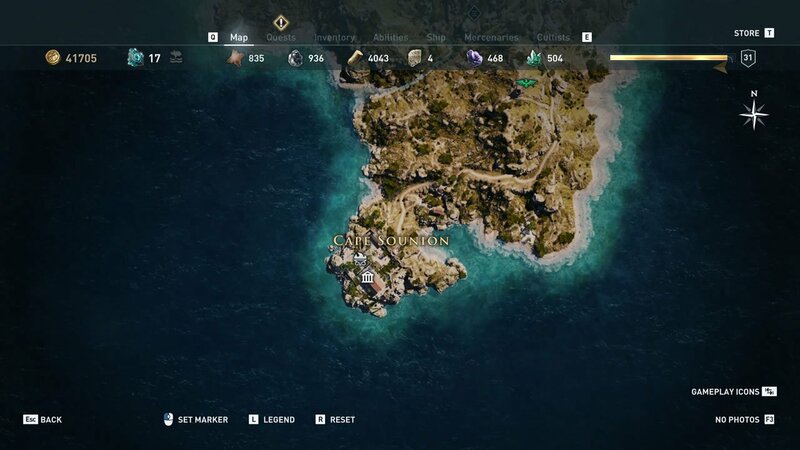 Xenia's treasure maps are just the tip of the iceberg — Assassin's Creed Odyssey has plenty more hidden treasures spread about Ancient Greece. 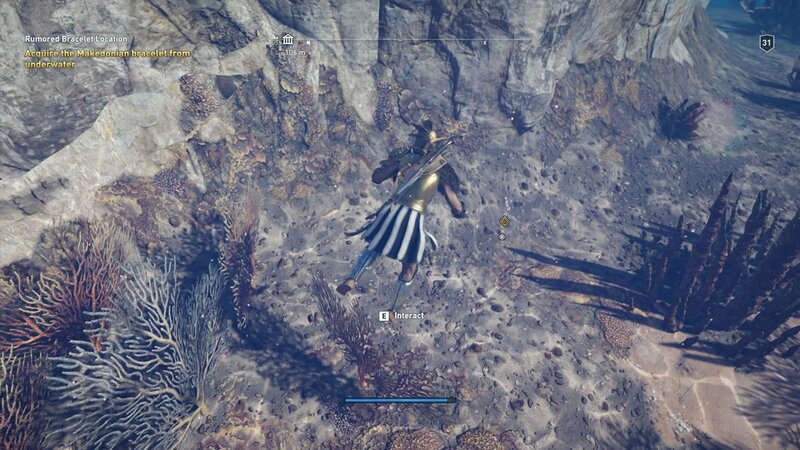 To learn more about the others, or to learn about other game mechanics, quest details, or boss strategies, make sure to head over to Shacknews' elaborate Assassin's Creed Odyssey walkthrough and guide hub.